We expect our girls to only have one litter per year, because we think it's better for her well-being and more importantly because it's just the way we want our breeding to be. Our kittens will not leave their first home before they are 12-weeks old. They will be identified by chip, dewormed and fully vaccinated (Typhus-Coriza-Leucosis). A kitten package (photos on CD, food, toys) will be provided when leaving for their new home. But why such a long time before they are available ? Kittens needs this length of time to be weand, autonomous, clean, familiarised etc. In brief, kittens need such a time to feel good as couch cat ! We want our kittens to be pampered in their new home and demand to meet potential families before any booking. We don't hold any grudge agains people who would consider to have one of our kittens for reproduction, however, be honest and we'll see whether or not we share a similar philosophy of cat breeding. 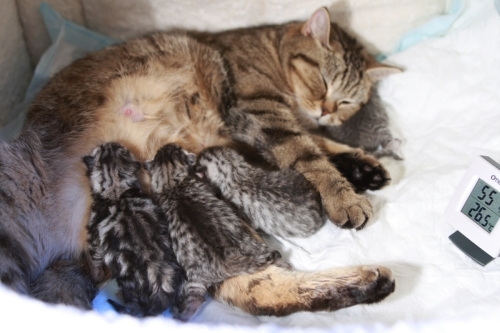 Kittens were born on June 10th.